Hi. Some day ago my ipad2 wifi+3G (european) stopped to recognize the sim card. I tried everything, iTunes reset, dfu reset, removing sim card, activating and deactivating airplane mode. Nothing...the sim card is ok on my phone so seems to be a hardware related issue and I'm out of warranty since march 1st (%^%%!!). There's something I can do myself? Thanks!! It happened the same to me on my ipad 2 3g (and the warranty expired two months ago!!!!!!!!! ) The wifi mode is still working but the ipad is not recognizing the SIM card and it appears "No SIM". Apple is not settling it and they offer me to change the whole ipad, paying like 270€! for another ipad 2 (not new, but repaired from others..). Hi YoloRepair, please post the repair for this so long. Look at the picture and check those pins for continuity using a multimeter. Once you find the line that's broken you have to solder a jumper wire directly to the test point. Make sure you isolate the wire so that it doesn't short at all. From what I've seen the red line is usually broken but check them all to be sure. I tried clicking the link to your photo but it doesn't work. Little help, please. Ryan can you email me - email should be in my profile. Been having some issues with ifixit lately. I'm getting no luck lately with ipad's. I have now encountered this NO SIM issue on an iPad 2. Replaced the SIM reader twice just incase of faulty 'new' hardware. 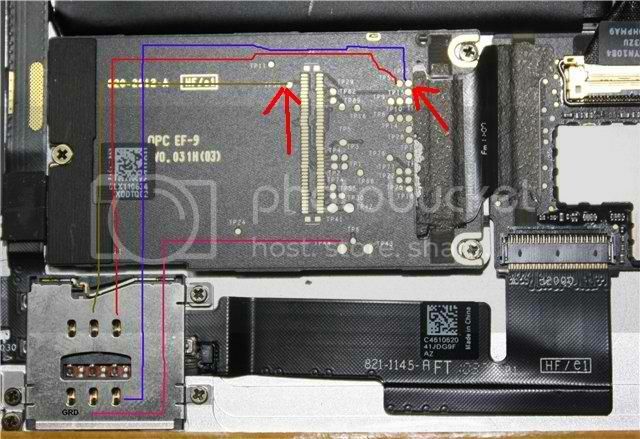 Checked the photobucket picture shown above and have no continuity on the red wire from SIM reader to GSM board. Whats the best method of running a jumper. I don't have a board view of that part of the card. Powering it off sometimes help. Apple products is only a fashion statement, in the real world they don't have durability. Airplane mode method worked first time! Thanks! NO SIM problem can happen to iPhone and iPad. It happen because the sim card is not connected to it place. This method is worked for me. And i Hope it work for All of you too. 2.Remove the Touchscreen, LCD and LCD Shield Plate. 4. Insert the sim card, and see. Michele Pighi será eternamente grato(a).